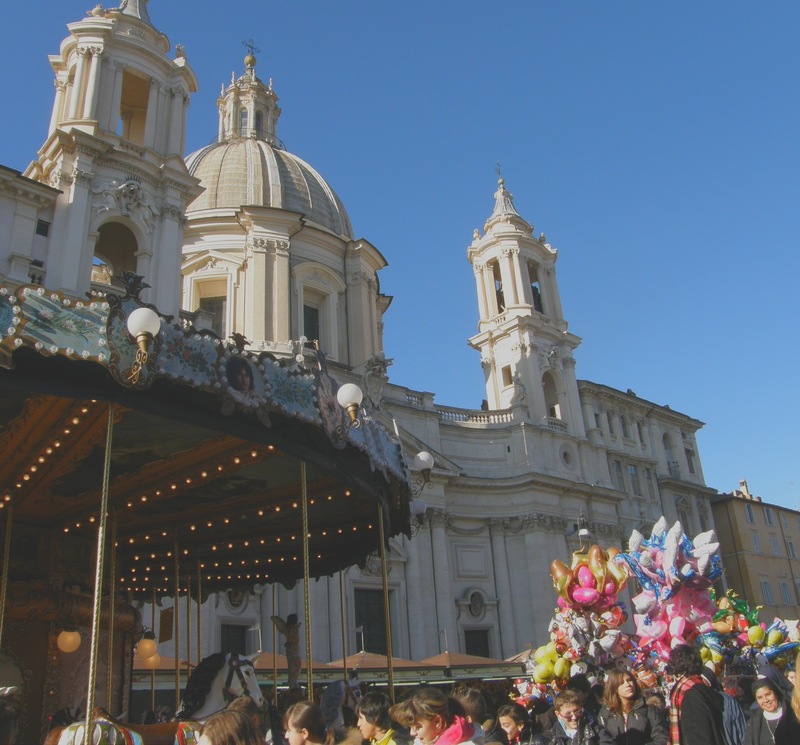 A Christmas carnival in Piazza Navona is just that – a carnival, complete with carousel, carney games (“A Win Every Time”), knick-knack booths, balloons dancing with the wind, hot and cold food, classes of kids corralled by clusters of nuns, litters of tourists marshaled around by guys and gals waving them on with numbered signs, and dueling guitarists. All this counterpointing the ageless statues and churches that give substance to this celebrated canyon a couple of blocks from the Pantheon in The Eternal City. I quickly snagged a cimballi calde (hot doughnut) to hold me until lunch. A cimballi is a Roman doughnut about the size of a small pizza and can be eaten plain, sprinkled with sugar or covered with Nutella (a chocolate-hazelnut butter spread popular here). I hadn’t had one since one of the officers aboard our freighter cooked a batch one morning. The dough is much tastier than the U.S. donut, it’s deep-fried but as flat as a pizza, has a less fatty texture and doesn’t curl up into gut-busting balls to play havoc with your digestive processes and system. We went to Rome after the high season opened Dec. 8. It closes Jan. 6. Both days are national holidays here. The first is the Feast of the Immaculate Conception; the closing date is Epiphany, also known as Little Christmas in many quarters. For our first stop, we arrived at my favorite optometric shop on Via Nazionale just as the owner was unlocking his exterior display boxes and I bought a couple of pairs of sunglasses. They’re about one-fifth the price of expensive ones sold under such American trade names as RayBan,Foster Grant, etc., which are made by these same Italians. Bev got an eyeglass frame to take home. After strolling into and by the ritzy boutiques stretching from the Spanish steps to the Trevi Fountain — and picking up a gelato across from the fountain at one of the finest gelateria in the universe – we went into the Pantheon for the first time. It’s now a basilica with Mass offered every Saturday and Sunday, although it’s closed Christmas Day. The sun was bouncing off Roman roofs so we didn’t have to worry about rain falling in through the hole in the massive copula that also lets light pour into the building, the only one to survive two millennia in its entirety since Roman times. After lunch at my favorite eating spot – Melo’s, a Sicilian ristorante on the steps leading down from the bottom of Via Nazionale to il Vittoriano and the Forum – we decided to take an earlier train back home instead of hanging around into the evening. We were tired. The sun was rising as our train pulled out of Chiusi and it was setting as we rolled out of Roma Termini. read much more, Please do keepp up the awesome work.